When people are convicted of crimes, we know that they are sentenced to time in jail or prison, to perform community service, and sometimes to undertake drug or alcohol treatment. But they are also routinely sentenced to legal debt. Beyond just fines or restitution, defendants in some jurisdictions are required to pay for costs related to their public defender, DNA collection, jury, court paperwork, room and board in prison, electronic monitoring, probation, even for collection of the debt itself. 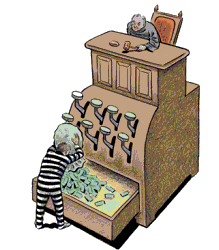 They are, in essence, charged “pay as you go” fees for their use of the criminal justice system. This entry was posted in Policy on June 6, 2014 by fedwards.